Matt Price curated a two person show I was part of at The Nunnery in Bow. I was excited to show him my newest work since it was almost two years since we first worked together. I also wanted to ask his advice on art writers, particularly art writers who were interested in similar ideas as mine. At this stage I had developed two ongoing series of paintings. The first series were the museum display paintings I’d previously discussed with Bruce. These were now finished although I still felt very anxious about them as they still seemed unresolved. Matt and I talked about what makes an unresolved painting and the difficulties of working out how to ‘fix’ it. The mood of the paintings seemed uncertain but Matt was confident that they would work. The other series of paintings had developed out of sketches of photos from recent travels. 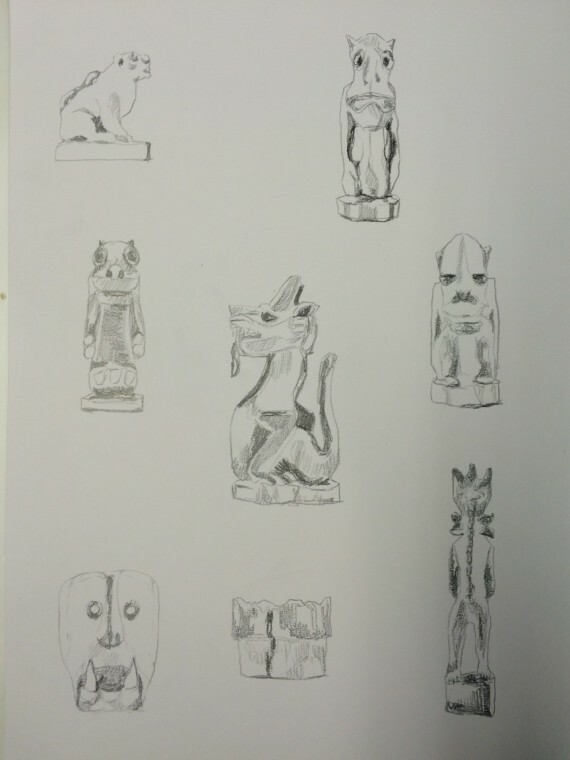 I was keen to show Matt the sketches too following up on Caroline’s earlier advice about exhibiting drawings. He suggested they would work really well as mono prints, and to try out different ways of sketching ideas that weren’t in pencil. 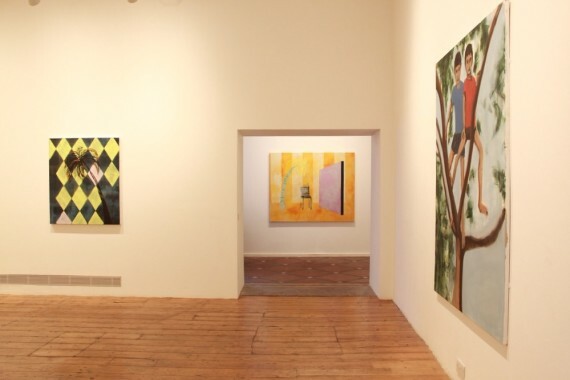 Some painters that were brought up in relation to the new series – Benjamin Senior, Jonas Wood and Jo Baer. As Matt works in publishing, he was able to point me in the direction of really interesting blogs and publications where I could find upcoming writers who I could easily connect with. We talked about making introductions to new people and overcoming the fear of ‘networking’. It helped finding a common connection with people I wanted to meet. I am now working on a list of writers who I am looking to work with over the year. Bruce is an artist and curator of Trade Gallery, Nottingham. We met at a group show I was part of ‘The Trouble with Painting Today’ at the Pump House Gallery. My painting ‘Pas Faire Comme Moi’ had caught his attention and we briefly discussed how it had become sentimental to me. After exchanging contact details and keeping in touch over the past year, Bruce came to my studio to have a look at some new paintings I was working on. I showed Bruce some drawings I made at different museums in London. Having spent the last two years making paintings of islands, I was drawing a correlation between museum display and landscape painting. Looking at the objects in their display cases, I was interested in how they became flattened, rendered equal and obsolete in their new context. Each object was now part of a diagram of someone’s travels and they were no longer functional or sacred. I wanted to include these objects into my paintings, and reintroduce figuration back into my work. I was unsure of showing Bruce these paintings so early on but he was very kind and open to my ideas. We talked about very painterly things – deciding how something should be painted, using beeswax medium, flashe paint, particular masking tapes etc. The question of style came up, should painters adhere to a particular style across their work or can it evolve or mutate. My opinion favoured the latter having decided at the beginning of the year that my studio practice will no longer be governed by masking tape. Bruce wanted to know more about my method and how the paintings developed. I revealed to him that only recently I noticed how influence of nineties platform video games played an important part in my work. I showed him a collection of images of Sonic the Hedgehog which I’d been saving over the last couple of months. We talked about how video games can be an interesting way to think about painting – the flat one point perspective and a world that is always contained within a rectangle frame. Even the bright acidic colours and abstracted objects were clearly evident in my paintings. 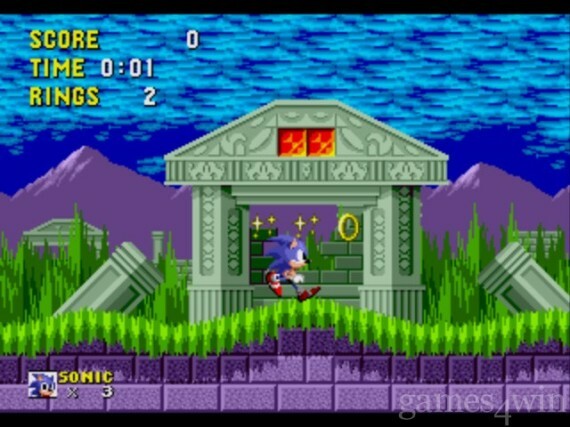 There was one image of Sonic in particular that related to my current museum project, where he is running through a landscape of ruins and ancient objects. My studio visit with Bruce really helped flesh out my new ideas. It was the first time I’d spoken with anyone about this work and it is always useful to articulate these out loud to someone else to see if they make sense. He asked me to send him images of my work over the next few months. This will motivate me to finish them! The artist Matthew Krishanu recommended I meet with Caroline as he saw some correlation in our work, but also someone who could provide helpful professional advice. I had seen Caroline’s work at a number of exhibitions and was intrigued by the way she painted landscapes and interiors. I was also interested in how she got into shows and met curators who were interested in her work. At the time my solo exhibition was still up so I suggested meeting at a cafe first before heading over to the gallery. At the cafe we spoke at length about what we had both achieved and the things that had brought us up to this point. I had just finished a year long residency at the Florence Trust, London and was showing the work I made at the exhibition. I spoke with Caroline about how I returned to London after studying in New York for two years. She asked about my experiences there and what contacts I managed to make. She said it was good that I kept in touch with my professors and friends but also suggested making a trip there to reconnect with people. We talked about previous exhibitions and I explained I felt I didn’t make the most of my opportunities when I was younger. This lead us to talk about networking and the importance of not only meeting new people but keeping in touch with those you exhibit with. Caroline was very encouraging in her advice about approaching galleries I wanted to work with. We also spoke about the use of social media, and how we were both using Instagram to promote our work online. She spotted some of my drawings that I recently posted and asked whether I ever show these alongside my paintings. I haven’t done so before but its something I’m now definitely considering at my next show. It felt very motivating to speak with Caroline as she has a solid approach to making and showing her work. I really appreciated her openness and direct advice. I took away a lot from our conversation and have already planned a trip back to New York.